Viridium products offer the possibility of recreating a green corner in any setting: be it a garden, a terrace, a balcony … the result will be very natural, pleasurable and durable. 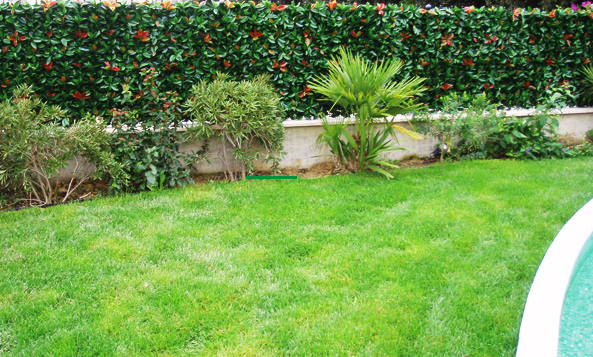 Viridium’s synthetic hedges, plants and grass will get you the desired result even if you’re short on green fingers. Most Viridium products are made of a plastic material treated with a special anti-UV process able to resisting the outside. Viridium can meet all installation and taste requirements, always focusing on quality. Val International offers a wide range of products designed for positioning outside your home without deteriorating over time. They are made with a special plastic material, capable of standing up to various weather conditions and quite extensive temperature ranges (-60 to 65 °C) and to the sun, the bane of outdoor products. The photo-resistant pigments used to make the products even more natural lend an intense, vibrant colour that remains unaltered for many years. Val International has always been committed to anticipating trends with a strong inclination towards research and development. Products are conceived and designed within the company, in terms of appearance and chemical composition, prior to production by exclusive partners.